Through four different and thought provoking events the speakers and those attending the symposium took part in a deep reflection on the meaning of the Institute’s work and history. Situated at its heart is the work to catalogue the Institute’s archive, what it means for this unique document of social history to be made publicly available for society at large and those of us working as Tavistock practitioners today. The opening up of the archive as moving from the shadows of our forebears to standing on the shoulders of giants. A video recording of each presentation will be available to watch on this page soon. From before the Tavistock Institute even formally existed, its work has been closely connected with trying to understand and improve how people work together. During the Second World War, the group who would go on to form the Tavistock Institute of Human Relations were brought together by a ground-breaking project to help the British Army to select officers. Beginning with work on “problem” officers and intelligence on Germans methods, they worked with soldiers to devise new methods of selection. We explore how this remarkable collaboration came about, and the archive finds that made it possible to examine the work from the psychological point of view for the first time. The selection methods devised during wartime were soon taken up by commercial enterprises, most notably by Unilever Ltd., one of the largest companies for consumer goods. There, “managing” became a general and distinct ability, irrespective of any specific subject. Management candidates were to be assessed regarding their future potential rather than their record or skills. “Managing” became deeply intertwined with managing (and improving) oneself and relating to others – and these qualities could be determined with the Tavistock’s psychological techniques. We trace the emergence and significance of those techniques from wartime-work to early forms of what nowadays would be called “assessment centres”. Daniel Monninger Daniel Monninger works on a PhD on the history of the Tavistock Institute of Human Relations and its influence on the field of work and on conceptions of working people. He is based at the Max Planck Institute for the Study of Societies in Cologne, Germany. Alice White Alice White completed a PhD titled ‘From the Science of Selection to Psychologising Civvy Street: The Tavistock Group, 1939-1948’ and graduated from the University of Kent in 2016. She now works as a Research Engagement Consultant at Wellcome Library, London. The Tavistock Institute has for 70 years engaged in action-research and change-oriented projects from different methodological and theoretical perspectives – variously based on group-relations, socio-technical systems, work-redesign and ‘open learning’ pedagogies. In the 1970s an approach combining community-development and work-organisation approaches informed two large-scale industrial action-research programmes one in the Irish fertiliser industry; and the other in an Anglo-Norwegian shipping company. Both worked closely with managements and trade-unions at a time when notions of ‘industrial democracy’ were being explored in the UK and elsewhere in Europe. Setting these projects in their historical context highlights both how institute work is interwoven with societal change; and how project work feeds into the ‘institute as a laboratory’ where project learning is internalised and conceptual thinking is informed by grounded theory. Between these projects and a global socio-technical context (poised between Taylorism, teamwork and automation); and a socio-political context struggling to accommodate to demands for democracy in the workplace. Between ‘community development’ approaches and a world-view that favoured autonomous work groups and engaging with small groups of senior managers or Board members. Elliot Stern co-led this stream of work in the 1970s together with Dr Patrick Quinn now deceased. Elliot joined the Tavistock Institute in October 1968, recruited by Emery, Trist, Higgin and Foster to the then Human Resources Centre (HRC); and left the Institute in 2004. He is a Fellow of the UK Academy of Social Sciences; Emeritus Professor at Lancaster University and visiting Fellow at Bristol University. Fiddy Abraham joined the Institute in 1976 to work on the action research programme with the shipping company, supporting the development of communities on board ships and the re-organisation of back-office functions. She continues to work as an organisational consultant with the Tavistock on issues of wellbeing and performance. 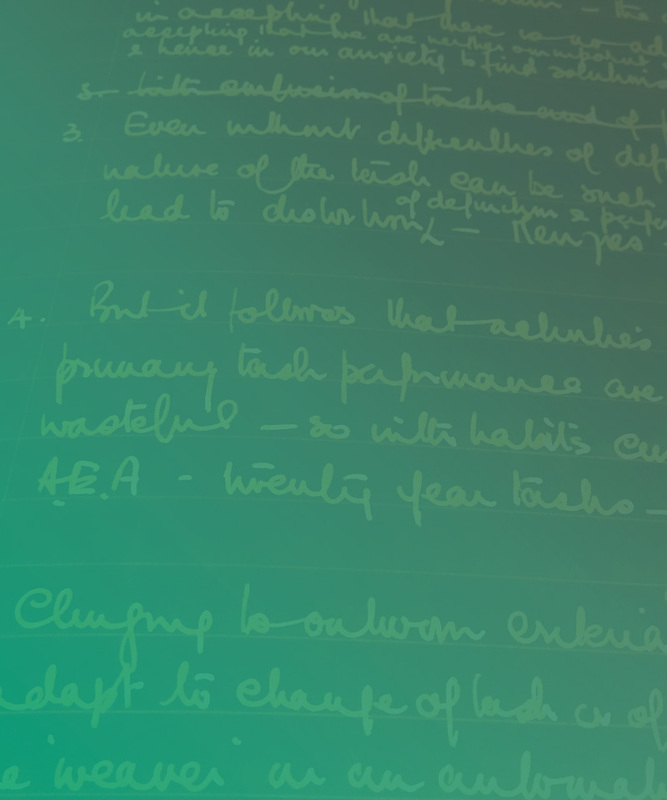 Through engaging with the recently catalogued archive, Eliat sifts through 70+ years of Tavistock Institute’s work in the areas of care and mental health of children and young people. She examines the lived experience of orphanness, being looked after and abandonment through the institute’s work across the decades as well as through conversations with colleagues and reflections from her own experience. The hypothesis being that the Institute’s identity as an independent, autonomous, defiant and self-sufficient social science organisation is co-created through and by the work as much as by the untold life journeys of its employees. In other words, the Institute’s identity is rooted in a lived experience of orphanness over the years. It is an untold story of living with and thriving through a void, not ‘just surviving’ it. Eliat Aram joined the Tavistock Institute of Human Relations 12 years ago and has been its chief executive officer for nine years. She has been part of the wider institute’s Group Relations conferences network since the mid-90s and the late Eric Miller was her 2nd supervisor for her PhD where she dedicated a chapter to the complex experience of learning through Group Relations conferences. In addition to her management role, Eliat is a chartered psychologist and a UKCP registered Gestalt psychotherapist and supervisor. She is an active member of the Institute’s Group Relations and professional development programmes; she coaches, consults, teaches and directs conferences nationally and internationally. Words, melodies, beatbox and performance all soundscape a performance of poetry. Dreadlockalien was present during the day’s symposium and his performance at the end of the day was a creative response to the day’s discussions and the festival’s themes. Dreadlockalien is a Performance Poet, with roles including Birmingham Poet Laureate 2005 / 6, Host BBC Radio 4 slam poetry, Director of Colour Free Visons, New October Poets and Write Down Speak Up. He tours the world inspiring young writers and performers of tomorrow. His urban hip-hop dub flow verse delivery of words and concepts address social issues such as citizenship, identity, immigration and Black British experiences. Dreadlockalien has worked with TIHR on a project with looked after young people in London, creating poetry on mental health impacts important to the young people. In 2015, Dreadlockalien was performance poet at the Locating Cultural Value Conference at the University of Warwick, providing a poetry plenary for the day and performing new work created in response to the findings of the Warwick Commission on Cultural Value.